Come out to a Youth Registration Night! Tennis Night in America (TNIA), February 28, 2011, promises to be a huge night of tennis with Pete Sampras, Andre Agassi, Ivan Lendl and John McEnroe squaring off in the BNP Paribas Showdown at the world's most famous sports aream, Madison Square Garden in New York City. It is also a huge kickoff to over 700 Youth Registration Night events happening across the nation, one for sure happening near you in March! And we want you to participate in 2011! Six of these events are being held at facilities around Central Arizona and it's going to be a great time! Parents and children are encouraged to inquire with and sign up during the month of March for upcoming Spring and summer tennis programs! We want all kids on court experiencing the joy of this great game! 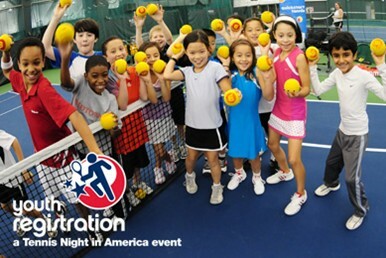 When any Junior 10 or Under purchases a 1-year membership for only $19, we’ll include a 21-, 23- or 25-inch racquet and the appropriate red foam, red felt or orange low compression ball (ARV: $21) in line with the USTA’s revolutionary 10 and Under Tennis initiative. Juniors 11-18 will receive a USTA Jr. Team Tennis blue and orange sling bag, the perfect accessory to take to the court (ARV: $30). To make this limited-time promotion available during your event, download and print the Special Membership Enrollment Form. Below is a list of Youth Registration Night Events taking place in Central Arizona. Contact one of these facilities below to inquire about the youth tennis programs they offer or to participate. It's as simple as that! Just show up! Kiwanis Recreation Center – Tempe, Ariz.
Chandler Tennis Center - Chandler, Ariz.
Gene Autry Tennis Center – Mesa, Ariz.
Scottsdale Ranch Park – Scottsdale, Ariz.
Tolson Totally Tennis – Avondale, Ariz.
PGA Superstore – Chandler, Ariz.